Wabash football fans will be able to tailgate at Ohio Wesleyan on September 18, 2010 before the game - the only problem is that we're not quite sure exactly where we will be. Ohio Wesleyan, just like Wabash, has a significant amount of construction going on so their campus map is lagging just a little. 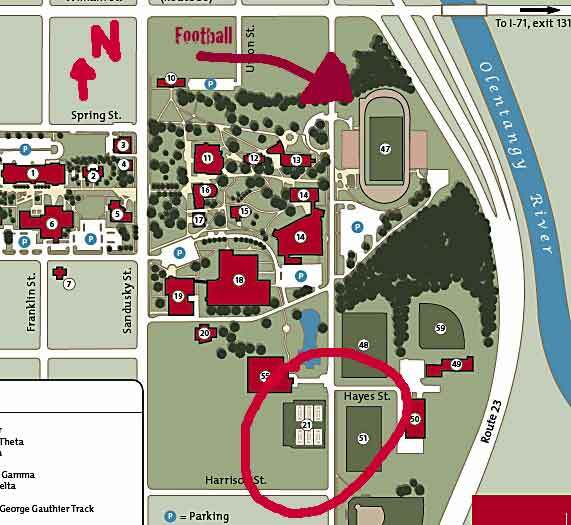 OWU officials have suggested a parking lot approximately where the circle is on the map. So we'll plan on getting together beforehand in the general area just south of the field. Look for the Wabash flags. Please bring your own food and drinks - we'll start at 11:00 AM and end in time for kickoff. For any questions, please call Tom Runge at 765-361-6371.